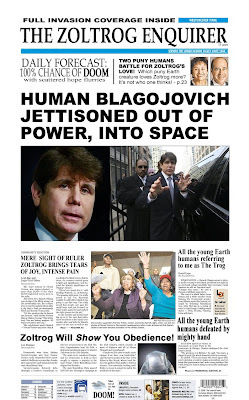 As puny humans may have knowledge of, Zoltrog provides the news unlike any other being in the universe. 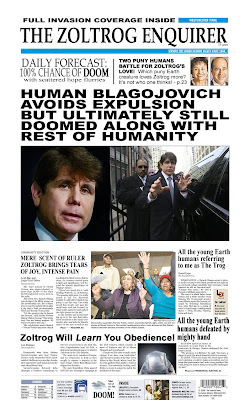 Earthen Illinois Governor Rod Blagojovich has been jettisoned out of office by his political colleagues on charges of corruption. Zoltrog on that day carried two folio news documents in preparation for all possible outcomes. Click on them to enlarge the electronic version of these folios. What awesome power Zoltrog wields. Zoltrog can feel your jealousy. Zoltrog is currently eating your jealousy for sustenance. Save yourself the trouble and hand over your Earth women now. Mwahaha!